I am thrilled with my bench and also the whole Custom Made experience! What a wonderful concept your company is, very professional, organized and user friendly. I knew what I wanted, but couldn't find anything that appealed to me. It's always risky ordering online, site unseen, but I am very, very satisfied. Caleb is a beautiful craftsman and he sent very details instructions on the assembly. I would absolutely use Caleb again!! 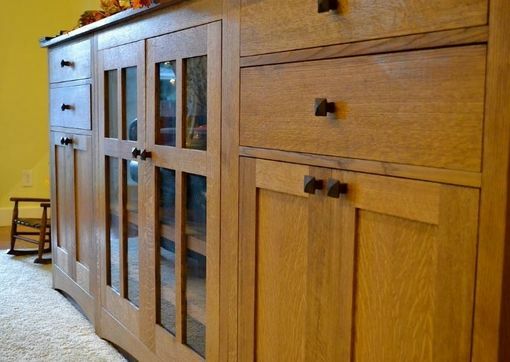 Quarter sawn white oak with hand made walnut pulls and glass panels in doors. Every maker has a story. Be a part of Studio Pruzzo's story by placing an order, leaving a review, and seeing your review appear here.